Gini and Tom Dideum of Treasure the Beach. Tom Dideum, Treasure the Beach Cleanup, is greeted during the Rain or Shine opening exhibition at Fairweather’s Seaside First Saturday Art Walk on April 2nd. 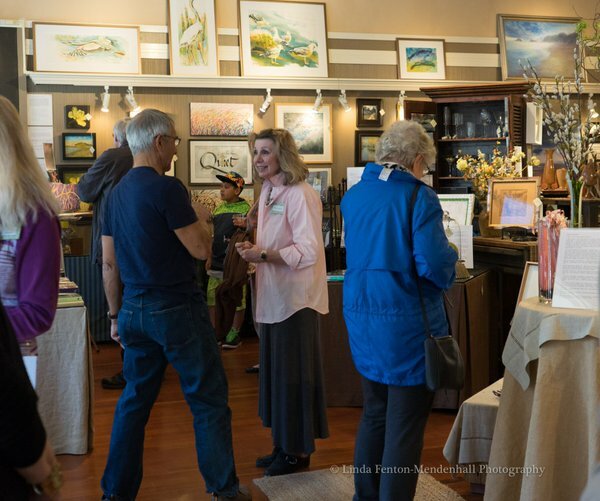 And, too, Gini Dideum spoke during the Art Walk program, which she has graciously done each April at the gallery, to highlight Beach Cleanup efforts and to kick off area-wide Earth Day programs. 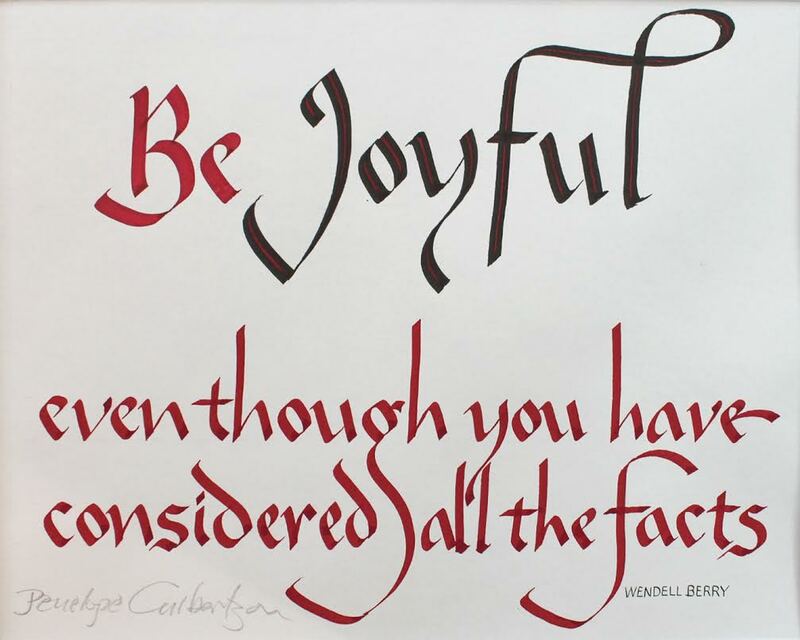 Original art created for Earth Day titled “Be Joyful” quote by calligrapher Penelope Culbertson. Please visit http://www.fairweatherhouseandgallery.com/artists/ Penelope Culbertson for more information. If every visitor spent 10 minutes cleaning up after themselves and depositing their trash in an appropriate receptacle, the value to Seaside and the state of Oregon would be over $1.5 million if they were paid minimum wage and they did this once during their entire visit. The value of a clean beach is priceless. Did you know that on the first Saturday of each month there is “Treasure the Beach Cleanup” campaign, an event that takes place in Seaside? Volunteers meet at 9 a.m., along the Seaside Beach at Seashore Inn on the Beach, 60 N. Promenade. This cleanup has been done for years by volunteers that want to contribute back to the community. Keep the good. Keep the beach clean. Be green. Save the date. First Saturday come rain or shine. Beach cleanup. Out of state family members were visiting. Walking on the Gearhart beach very early one morning, they gathered trash discovered from the nighttime high tide. They collected until their arms were full. Trash included a soaked beach blanket, plastic water bottles, assorted caps and straws, orange peelings, one old sneaker and a sandy tennis ball. It came to be that they stored the trash near a drift wood log, with the thought to pick up the trash after completing their walk. Later, however, when returning to the hidden cache spot, it was not where they left it for they found someone had picked up the gathered debris! The family remembered that they had seen a car go by filled with happy people (anytime on the beach is happy time in vacation land). The happy people waved back at them. They recalled that the car passed by about the time when they were storing the trash. Did you know that some of Oregon’s beaches are a secondary highway? Other beaches are closed to driving to protect seabirds nesting and sea critters under the sands. Surely, the driver in the car understood that they were continuing on their morning walk. Perhaps, that is why they picked it up for them. And, yes, indeed, the family did another walk about and gathered more debris before leaving the beach on that very early spring morning! For more information about keeping the beaches clean please visit solveoregon.org . Non-profit organization with programs and projects to enhance the livability of Oregon.